The primary project I worked on during my internship at the Children's Hospital of Eastern Ontario (CHEO) was redesigning the pharmacy. CHEO recently secured over $1 million in funding to purchase automation equipment that will drastically change the workflow and processes in pharmacy operations. This new equipment will allow the pharmacy to package medication in unit dose form, distribute these packages to patient care areas, and provide superior tracking and management of inventories both in the pharmacy and in patient care area inventories. 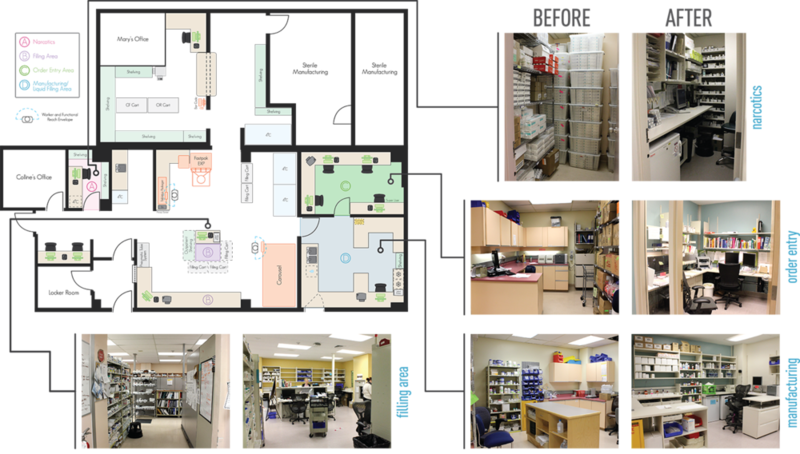 The current pharmacy thus had to be completely redesigned to accommodate the new equipment and facilitate the new workflow. Despite the need to create a more efficient, logical workflow within the pharmacy once the new equipment was implemented, there were a number of constraints to consider. Budgetary restrictions and facilities constraints were major factors in the redesign. Initially, walls and millwork were not to be removed as the cost would be much higher, and removal would release mold into the air. More funding for the project was eventually secured to finance a complete redesign of the layout. Workflow, user requirements, ergonomics, and noise were all taken into account to develop the best layout possible. Through interviews, observations, and consultations with staff, facilities, Ottawa Business Interiors, and Amerisource Bergen (manufacturer of the new equipment), a number of different concepts were developed. The most important change was moving the OE area to the back corner of the pharmacy where it is closed off and free from distractions, which will help to increase patient safety. The filling area was also opened up to improve flow and increase workspace. Workstations were also added throughout the pharmacy for technicians to complete documentation and other work. Overall, the pharmacy is now a much more efficient and pleasant place to work.